Tomorrow will bring the long awaited PS4 update that adds external hard drive support, voice chat for remote play, and more. As was announced back in February, external hard drive support is coming to the PS4 in the next system update. Sony has now announced that update will roll out the door tomorrow. But that's not all the new update will bring to Sony's console. Along with support for external hard drives, the new update also adds voice chat for remote play, allowing you to keep talking with your friends even if you're not at your PS4. It also brings Boost Mode to the PS4 Pro, which Sony says is, "designed to provide better performance for select legacy titles that have not been patched to take advantage of the PS4 Pro's faster CPU and its faster and double-sized GPU." 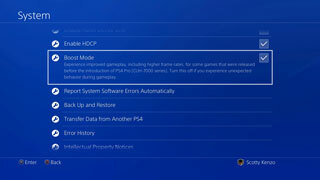 You can find and enable Boost Mode in the PS4 Pro's System Settings menu. Other features found in this update include improved 2D images on PS VR, better notification when players are using off-console apps, and updates to the PS Messages and PS Communities apps on iOS and Android. You can find a full list of what's included, along with all the official descriptions, over on the PlayStation Blog.